A.J. Howarth has many years experience in rewiring domestic and commercial properties. our Wirral & Chester electrian’s take great pride in our finished job and we can offer a free quotation on part and full rewires. 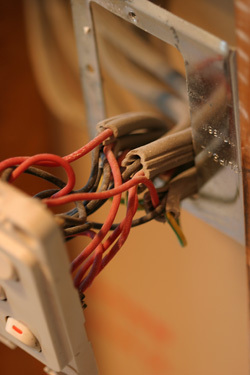 If your property has any outdated electrical wiring, dangerous or non-compliant electrical equipment, including fittings, cables or distribution boards, it is extremely important for the safety of you and your property that you get a fully qualified localWirral & Chester electrician like A.J Howarth to inspect and replace it. If you find that fuses in your property blow regularly or you notice that sockets overheat or even not work at all there is most likely a problem with the electrical wiring. Often this is the case in properties over 50 years old. We strongly recommend that you call us now for your free quotation for a part or full rewire. Almost all electrical installation work in the home must be carried out by a Company who are registered with a Building Regulations Part P self certification scheme. A.J. Howarth is a registered electrician with the National Association of Professional Inspectors and Testers(NAPIT) which is a government approved scheme and are accredited to to NIC EIC standards. Our ability and workmanship is regularly assessed to ensure that we meet the standards required by the association and trustmark which is a Domestic Installer Scheme.